The seventh graders observed how diffusion can cause cells to lose rigidity when they placed carrots into salt water. They learned about selectively permeable membranes when they saw that tiny iodine molecules could pass from a water solution through plastic bags to react with the starch within. The children then learned about the four main types of molecules found in living things. They were introduced to chemical and molecular bonding. We treated gelatin with enzymes from fresh pineapple to learn how important these proteins are in chemical reactions. 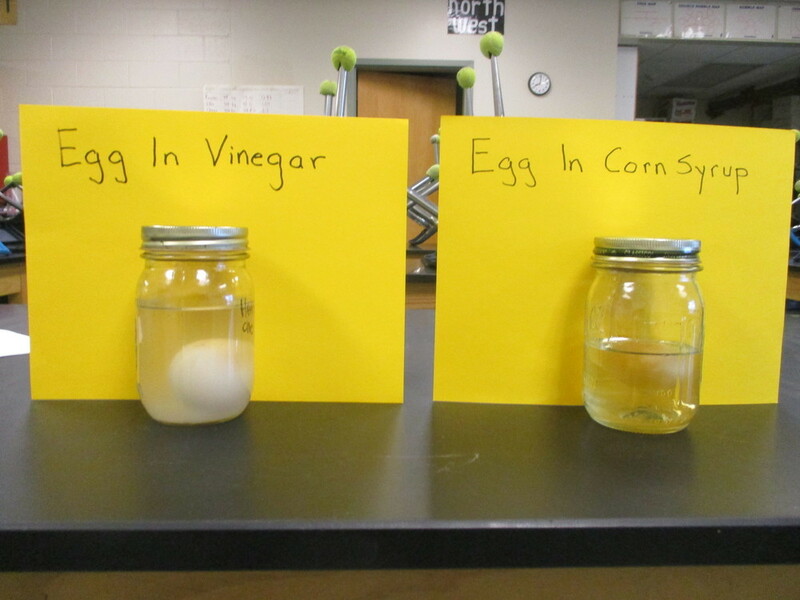 In lab groups, students completed a several day experiment to observe the effect of osmosis on an egg cell. To learn about respiration and photosynthesis, the children used the indicator BTB to see how water plants take in carbon dioxide and release oxygen during photosynthesis. As winter bore down on Lyme, we began a unit on cell reproduction. The children studied the steps in mitosis and then looked through microscopes under high power to see onion root tip cells and fish egg cells undergoing mitosis. This was followed up with a study of meiosis. Of course, one cannot consider meiosis without learning about DNA. As a way to better understand this important molecule, we made origami models of DNA. Following the unit on cell reproduction, the seventh graders began to learn about heredity. They found out about the important work Gregor Mendel did with pea plants in the mid 1800's which laid the foundation for modern genetics. The kids constructed a model of the inheritance patterns of dominant and recessive genes by pulling different colored beans of “male” and “female” alleles from paper bags. In the process the children used probability to predict the outcome of the experiment. At the end of the unit the children learned that many traits are actually controlled by more than one allele or set of genes and that some diseases are the result of genetic errors. Finally, they found out about some advances in genetic engineering.